Today’s App Review is Don’t Drop Ball by Nob Studio. I am a big fan of ball balancing games like Aerox and this App is very similar but with a twist. The App itself is very good and you have to try and get the ball around the circuit without crashing which is quite challenging. However, after a few levels when you are getting into it you encounter the ‘twist’. Even though I had previously read about what was going to happen I had gotten into the App and having a lot of fun and my eyes were so focused on keeping the ball in line that when that so-called twist came along I was kind of taken by surprise. The App is fun and I think it would definitely make a good April Fools prank. The only complaint is that I wish there was an option to play without the prank. The App is really good and would be a perfect game if the developers were to consider using the design as an option within this App or as an other App. I should add that the App description warns that the in-app surprise may cause people to drop your device and break it. I don’t think this is likely but just in case it does happen I did warn you! Today’s App Review is April Fool by rise uP! It is 1st April tomorrow so we all know that means a day of tricks and treats. If you’re stuck for ideas to fool your friends this is an ok App. The pranks are mostly office based and suggest things like ‘tape down the phone button on the phone so when the phone starts ringing and they pick it up it will keep ringing”. Another featured task is called Drinking Rotten milk and the aim is to add food coloring or marshmallows to milk and gross people out by drinking it. The App has some good ideas but none that would really work for me. There are a few annoying things such as constant pop-ups but my big hate is that the screen colors features a green to yellow horizontal gradient with white text making it extremely hard on the eyes to read so much so that I gave up on the App after reading just a few ideas. If you find an interesting prank you can choose to email it or bookmark it for later. Today’s App Review is IMDB Trivia by Playfield Apps. When searching for yesterday’s IMDB link in the App store I came across this entertaining App which challenges you on movie trivia the answers for which are easily found on IMDB. Test your knowledge of the movies and actors with this fun App. There are many different play modes for example you can match quotes with actors, movies with years, actor photos with movies etc. There are 5 different levels of difficulty so you can start off easy and move on up. You can also challenge yourself to match posters with movies as well as blurred photos with celebrities. The App links in with IMDB so you can also check out trivia and more information. You can also share your scores via social media and compete against others in the game center. 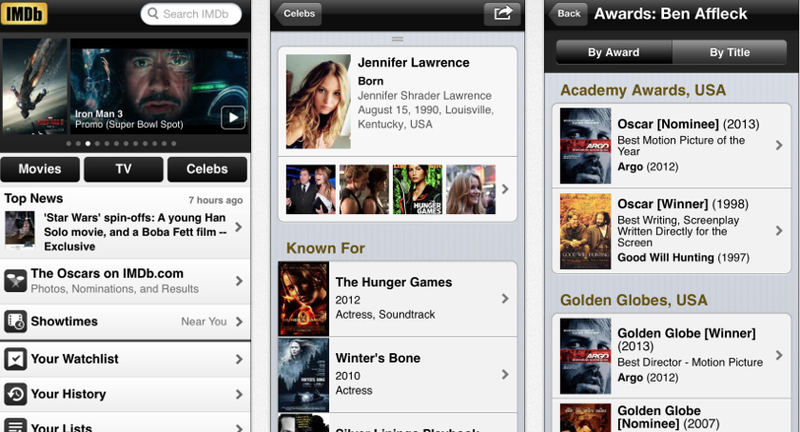 Today’s App Review is IMDB by IMDB. I can’t believe I had yet to review this App so there is no time like the present. IMDB is a great resource for finding information about actors, movies and tv shows. If you are going to see or rent a movie you can look up reviews on it. Similarly if you want a movie of a specific genre or one featuring a certain actor you don’t have to look any further. The App is especially handy if your having one of those moments where you can’t remember the name of a movie. It is also good for looking up information on tv shows ans how many seasons there were as well as episode reviews. The App is an all round source of movie information and very easy to use. And of course being free is an extra bonus. 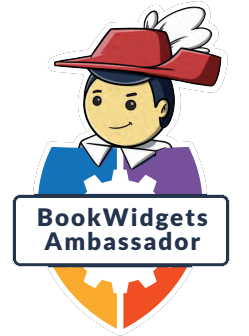 App Review – Wicked on Broadway Apps. 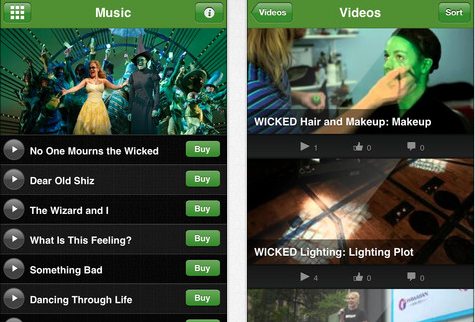 Today’s App Reviews will be looking at two different Apps which feature Wicked the Broadway Musical. The first App is Broadway Across America’s Wicked by DigiTab Media. DigiTAB Media has quite a collection of these Apps which give information on different shows and their appearances on tour. This particular App features Wicked’s times in Portland. There are also versions that can be downloaded for other shows including the popular Book of Mormon. The App surprised me at first. The download was over 200mb and took quite a while so I had expected it to include some interactivity and maybe even videos or behind the scenes info but I was totally let down when it was nothing more than a copy of the show playbill. It is a good source of information but nothing more than you get for free at the show which makes it quite a waste of space when it takes up room on your device. The second App is Wicked by Peter Yagecic. The Apps is the complete opposite of the above App. Instead of taking forever to download it is just 13mb and is also free. However it is everything the first App is not. It features many videos as well as previews of all the songs with options to buy the full versions. You can access photos from the show which can be saved and used as wallpapers for your device. There is an interactive map which highlights the locations where Wicked is currently showing both in map and list form. There is a cool option to make photo cards which adds Wicked graphics to your camera images. There is also a feature to keep you up to date with news about the show. This App is very interactive and a perfect source for any Musical or Wicked Fan. Today’s App Review is Vegas Towers by SiuYiu Limited. This App brings me back to my early gaming days in the 90’s and Sims Towers. Back then the aim of the game was to build a tower as high as you could with shops, rooms, restaurants and as much as you could cram into the space. The goal is to keep rooms clean, guests happy and keep that money rolling in. This App is a perfect tribute to the older Sims Towers App whilst at the same time being a more modernised version. What I really love is the name of the shops and restaurants which are a twist on well known restaurants so although names like; NAP, Taco Hut, Metro or Forever 21 may not sound like our top high street stores the appearance of the store front allow us to recognise them as well known retails and food outlets like GAP, Taco Bell, Subway, Forever 21. You can also built movie theatres or vegas clubs which are very interactive. I especially like how the theatres show real movies like Batman. While the goal is to build a tower as tall as you can you have to be careful because if you try to do it too fast it will be a disaster. Along the way you are forced with challenges such as restaurants burning down and unhappy customers but this adds to the fun. There are also challenges that earn you money. For example you get a reward when you successfully rent 25 commercial units or when you demolish 10 units. If you are out of inspiration you can go and head on over to some other towers and see how other people are doing which is always fun and there are some really amazing ones out there. So if you think you have got what it takes to keep your customers and guests happy you can download the App for free HERE. App Review – St. Patrick’s Runner. Today’s App Review is St. Patrick’s Runner by MTree Enterprises LLC. First of all Dóchas linn Naomh Pádraig (Happy St. Patrick’s Day) Searching around for an appropriate App which didn’t depict all Irish as drunks – seriously App developers we aren’t I came across this pretty cool game. St. Patrick’s Day runner takes on the same kind of form as the traditional Mario games which have been remade in several forms for iOS devices including the popular Lep’s World. The aim of the game is to get your runner to grab as many shamrocks as possible without falling or tripping over obstacles and you also have to avoid snakes and flying unicorns. As an Irish person I hate to say it but I LOVE this game filled with rainbows and a skinny leprechaun and all things mythical. The only complaint is that I was so distracted by the pretty unicorns that I kept dying…awww! The graphics are basic but beautiful and there is nothing much to the game other than the one continious level so not extra challenges but it is fairly fun and challenging. The little guy runs pretty fast too so you can’t take it easy. The only complaint I have is that the ads pop up very regularly on the free version and are quite irritating especially when your little character keeps running while you are trying to x out of the ad. Sad to say that the ads were the cause of many Leprechaun casualties but there is an option to get rid of them with an in-app purchase. If you’re a fan of games like Mario give this one a go although graphics and game play wise Lep’s world has my vote in terms of quality and stability. For the day that’s in it you can download it the App from HERE. Today’s App Review is Irishify by Holden Ghim. To celebrate St. Patrick’s weekend I am going to do an Irish App Review. 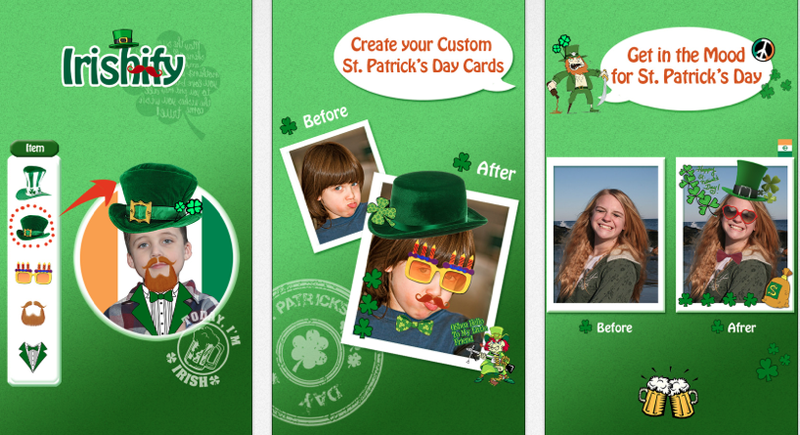 This App allows you to add Irish themed stickers to your photos to mark the day. With a choice of shamrocks, hats, text, leprechauns and more the opportunities to turn yourself green are endless. All you have to do is take a photo or load on from your camera roll and you are ready to go. While some stickers such as flags need to be unlocked with an in-app purchase there are still plenty of stickers to choose from so you can give yourself a big ginger beard, shamrock boe-tie, leprechauns hat and then you can add in some little leprechaun friends and finish off with shamrocks. Text can also be added. You can choose to type your own text in a color of your choice or you can use some pre-made text stickers which say all kinds of things from “Happy St. Patrick’s Day” to “Kiss me I’m Irish” and of course since half the world thinks all us Irish do all day is drink you can also add in text such as “Drunky McDrunkerson” and “You look like I need a beer”. The App has no use other than for entertainment purposes but it can be fun if you want to create some greetings for friends. All creations can be saved, shared through email, facebook and twitter and if you have a printer hooked up to your device you can also choose to print. So why not celebrate with a picture created with the App which can be downloaded for free from HERE.